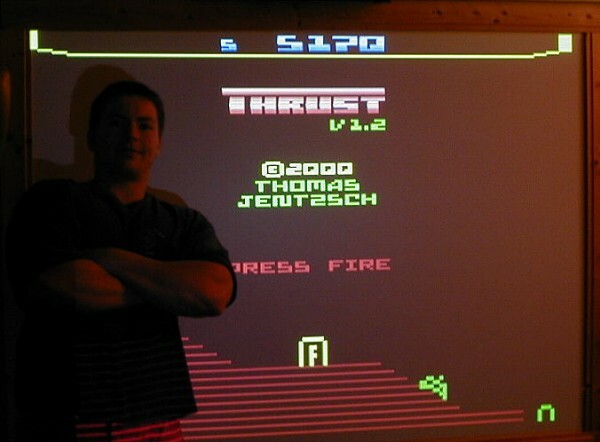 June 28, 2002: We have posted the winning submissions for the Thrust Plus High Score Contest. Congratulations to Tom Linke who won first place by scoring 205,150 points!. He's won Thrust Plus Special Edition package #1, plus a special certificate. You can look at all the winning entries below. Thanks to everyone who submitted pictures and we hope everyone had fun playing Thrust! 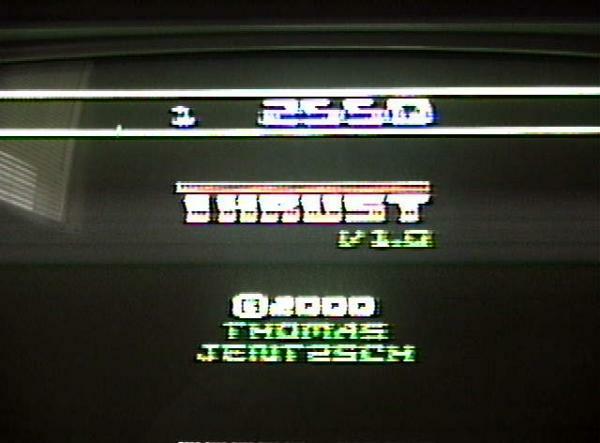 Thomas Jentzsch and Jah Fish have teamed up to create Thrust Plus, a new version of Thomas Jentzsch's popular Thrust homebrew for the Atari 2600. This new version supports two controllers that are new to the game: the driving controllers, allowing a much more precise setting of the ship's direction and the use of a pedal controller, allowing you to control your ship's functions with your feet. In addition, this new version of the game includes other improvements and refinements that are not in the regular edition. A Thrust Plus Special Edition package is being sold that includes a hand-numbered, limited-edition cartridge, a customized footpedal that can be used with Thrust Plus and other 2600 games, a custom, numbered box, a booklet containing the game instructions and development history, and a bonus sticker. More details about this Thrust Plus Special Edition package can be found here. First Place: Free Thrust Plus Special Edition package #1, plus special certificate, shipped to your door. Second Place: Free Thrust Plus Special Edition package #2, plus special certificate, winner pays for shipping. Third Place: Winner can purchase Thrust Plus package number #3, with the special certificate, and free shipping from Germany. 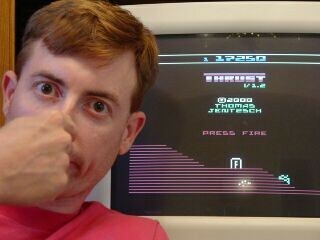 Fourth - Tenth Place: Those who already reserved a copy of Thrust Plus can try to secure a lower number by submitting a high score. This part of the contest is only open to those who have previously reserved a copy. The contest will run until Midnight (CST), Sunday, June 9, 2002. All submissions must be received by this time! To enter the contest, you must submit a photo that contains you as well as your high score, visible on your television or computer monitor. 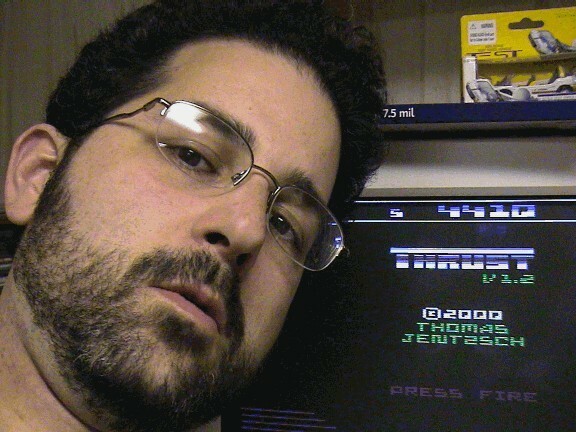 You can play Thrust using a 2600 emulator or a Cuttle Cart. The Thrust binary can be downloaded here, and you can find instructions on how to play here. Photos can be taken digitally or with a regular film camera and scanned in. Pictures should be sent to editor@atariage.com. If you don't have a digital camera, or access to a scanner, you can send us a photo via snail mail and we will be glad to scan it in for you. Photos sent via the mail must be received by the contest deadline. If you'd like to mail us a photo, please write to us and we'll give you the address to mail any photos to. First, make sure you are running at least version 1.2 of Thrust! You can can download Thrust right here, and the carts that Hozer Video sells also meet this requirement. 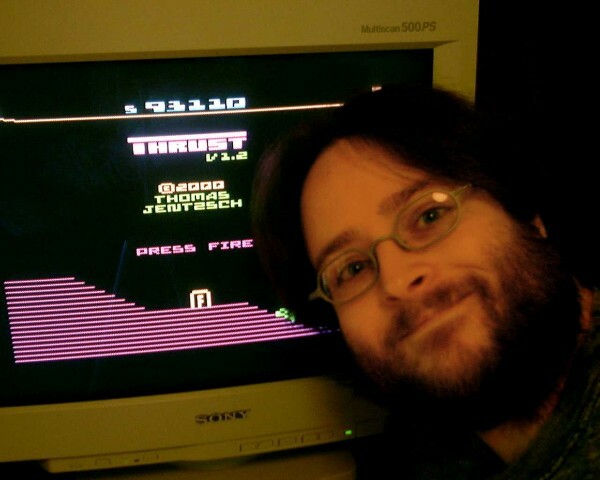 When you take your photo, make sure you take it on the title screen (when the game is over, Thrust returns to the title screen after a few seconds). This will allow us to see the Thrust version number. Set Thrust to Level 5! This is the easiest level. Unless you want to handicap yourself and make it easier for everyone to beat you. If you submit a photo and later get a higher score before the contest ends, you can send in another photo. If you use a flash when taking the photo, try to angle your camera so the flash is not perpendicular to the television or monitor. Submission photos will be posted on this page after the contest deadline has passed. 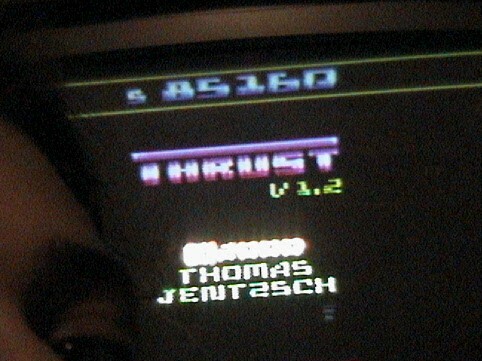 You can discuss this contest with Thomas Jentzsch, Jah Fish, and other AtariAge visitors in our 2600 message board. The contest ends at Midnight (CST), Sunday, June 9, 2002! All submissions must be received by this date!